Picked up my new XR yesterday and can't wait to finish the break in period. I traded a 2014 S1000R for a fully loaded white 2016 XR with side cases. The dealer hadn't received the side cases yet so they will be installed at the first service. The XR's are just arriving at the U.S. Dealers and none have the riding light on the beak. This bike is the best all around bike available today. 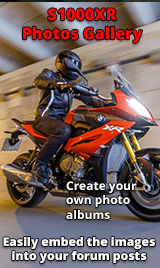 Welcome aboard the forums, it would appear you have a good understanding of the XR's potential by owning an S1000R. I am holding off on the luggage for the time being, not sure I want silver bags on my white bike. Kind of miffed with BMW for that over site, might see if they can be color matched some how. Yeah, I didn't notice the daytime driving light was absent until I geared up to leave the dealership with my bike, none of the folks at the dealership were even aware it was touted for the release bike. Welcome to the forum! You're right......this is one of the best "all round" bikes on the market today! My dealer acknowledged the missing riding light and told me BMW releases bikes without some items and does not send those items for later retrofitting... If you want them you need to buy them and pay for installation if necessary. I also just noticed that, although I have the touring option, my XR did not come with hand guards even though they are in the BMW pictures for my model. Maybe that is why BMW had a special discount through the end of June on the XR's. Regardless, this is one great bike and meets all of my riding requirements; I love my XR.